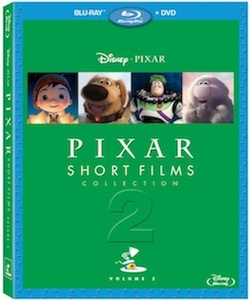 In Volume 2 of the Pixar Short Films Collection we are reminded of the long standing tradition of short films for Pixar going all the way back to their roots. I remember back in college going to short film festivals as often as possible hoping to catch the next short from Pixar or various other studios. That first time Luxo, Jr. hopped around on the big screen, or when I finally got to see Tin Toy and Knick Knack after having only seen photographs. It was amazing. This blu-ray takes us all the way back to the CalArts days for John Lasseter, Andrew Stanton, and Peter Docter. We’re presented with some of their student animation projects. John Lasseter spends some time introducing his work and talking about pencil tests, how he is a classic procrastinator, and his love of bringing inanimate objects to life. By stark comparison, Andrew Stanton discusses how he’s not really a fan of “magic” and “imagination” in animation. If you pay close attention you notice a similarity between an early character named Ted and Sulley from Monsters, Inc.
Then there’s the 12 shorts that the blu-ray contains - I was particularly excited to get to see two shorts that I had not yet had an opportunity to watch: Burn*E, and Dug’s Special Mission. Both of these were great because in the way they tie into their derivative works. Burn*E is about a repair robot on board the Axiom starship from the movie Wall*E who is just trying to make a simple repair. While in Dug’s Special Mission we get to see just what Dug was up to before he meets Carl and Russell in the movie Up. On the blu-ray you’ll also find two shorts from the popular Mater’s Tall Tales: Air Mater and Time Travel Mater. And one of my personal favorite Pixar shorts, La Luna - a story about a boy finding his own way in the universe. As well as some other greats like Presto, Day & Night, and Partly Cloudy. Even if you are a Pixar fan like I am, you probably don’t own all of these shorts, and you’ll also find some interesting material with the Director’s Student Films - I know I did.